Drowsy and distracted driving claims thousands of lives every year, largely because people do not believe they are driving impaired. The Fatal Vision® Drowsy and Distracted Goggles allow wearers to experience simulated impairment from drowsiness or distraction. 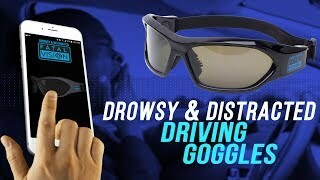 The Fatal Vision® Drowsy and Distracted Goggles are controlled and configured through Bluetooth using a mobile app on your phone or manually on the goggle. Mode A – Distracted Dial: simulates what could happen if someone takes his eyes off the road “just long enough” to dial a phone. Every three seconds, the goggles black out for three seconds. Mode B – Distracted Text: simulates the distraction that occurs when someone reads or responds to a text. The goggles black out for 4.6 seconds to simulate the amount of time a person’s eyes and attention are on his phone, rather than on the road. Mode C – Drowsy: simulates momentary micro-sleeps that build in waves until the eyes and brain shut down. The goggles black out beginning with a short half-second closure, and continue to black out for longer periods of time, progressing to a 10-second blackout. Download the Fatal Vision® Goggle app for free at the Apple App Store or the Google Play Store. Show your participants the results of drowsy or distracted driving with our Program Kit, which includes course tape, a stop/go paddle and a portable steering wheel, which they can use to “drive” while wearing the goggles. *Each goggle requires a separate phone app and device for operation when using multiple goggles simultaneously.